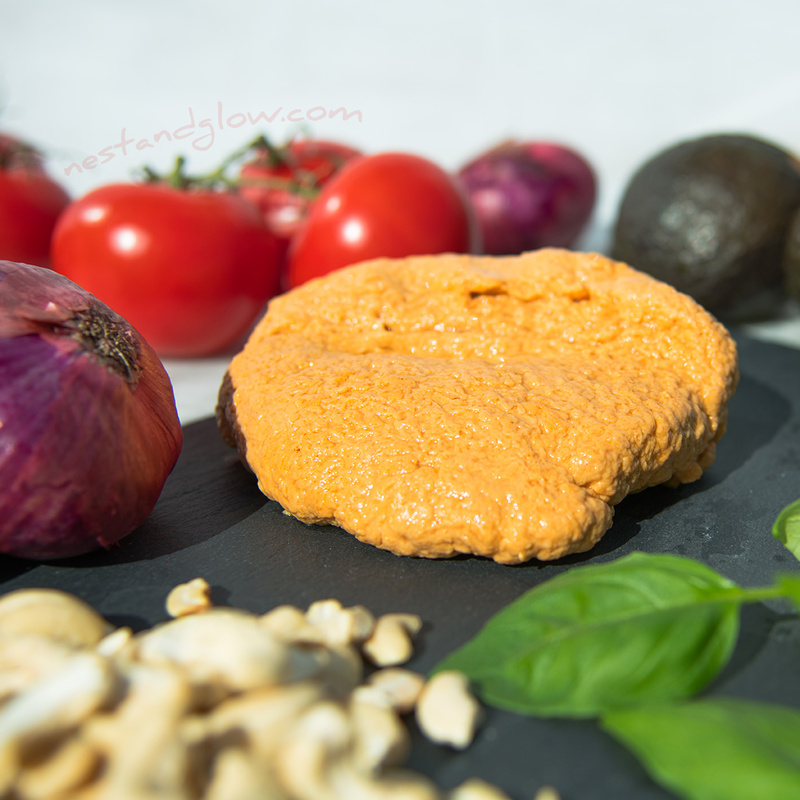 Vegan cheese recipe made from cashews and smoked paprika with a stringy mozzarella texture. This plant cheese is firm and hard so can be sliced or grated. No added oil and made from just 7 healthy ingredients. 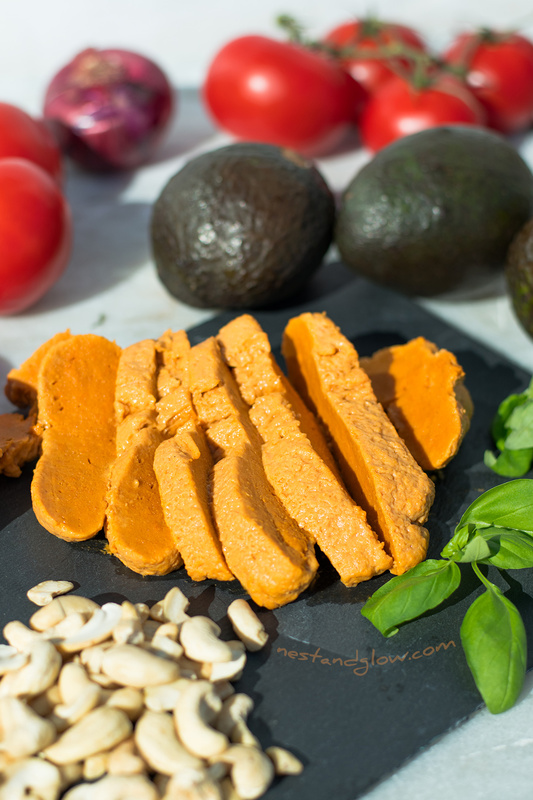 This vegan cheese doesn’t need an expensive blender to make it. Can be made in a small 600w bullet style blender. 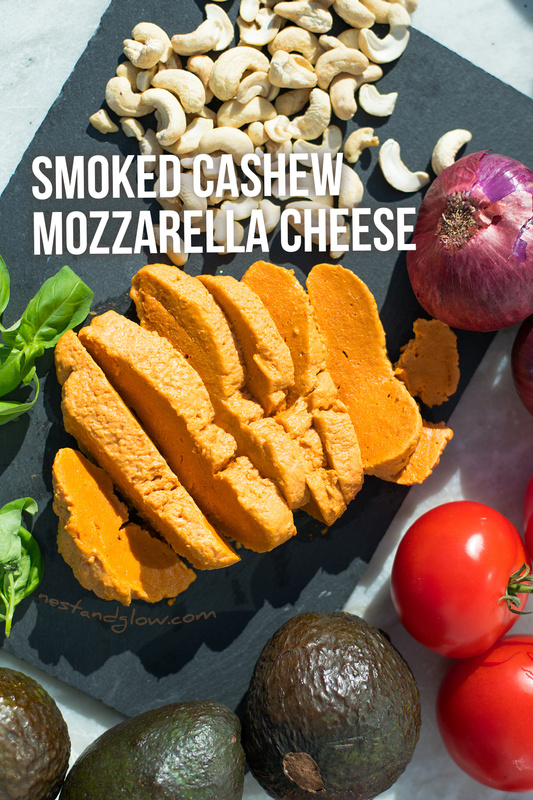 Super easy and quick to make this cheese – can be made in 5 minutes and then sets pretty quickly in ice cold water. This dairy-free cheese has a great texture similar to its traditional namesake. 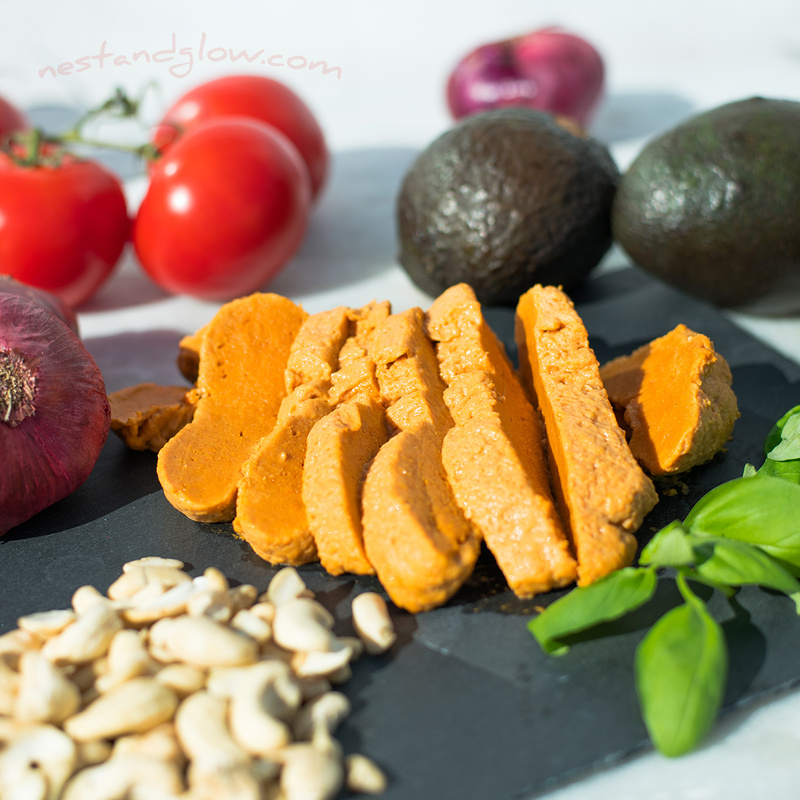 Full of heart-healthy fats, high in plant protein and loaded with nutrition. View no music cashew mozzarella video. This cheese was inspired by talking to an Italian artisan chef that specialises in vegan cheeses. He spoke about the long process that goes into his smoked cashew cheese. Rolling into balls, leaving to ferment, smoking, steeping in vinegar water and more. It was far too difficult and time consuming for me to make a recipe for that. However what I did take away from the conversation is to try to make a cheese that has both agar agar and tapioca starch. I’ve made cheese with agar agar (pistachio cheese) and cheese with tapioca starch but not both of them together. The cheeses he made did also contain potato starch but I didn’t want to add another tricky to source ingredient. The secret to this cheese is tapioca starch to give a stringy mozzarella texture. This starch is from the cassava root vegetable and although it’s nutritionally void only a small amount is used here. You could make this cheese recipe without agar and it’s still great but just doesn’t set as firm. You do need to constantly stir the cheese mixture while heating it to stop bits sticking and burning. Cashew nuts add a creamy fatty smooth taste and texture to this. You can replace them with macadamia nuts or sprouted sunflower seeds to make nut free. There’s no need to soak you cashew or macadamia nuts for this but for all other nuts and seeds, it’s best to soak. This process is called activating or sprouting and makes the nutrients easier for the body to digest. Sprouting nuts has been done by many different civilizations. The final cheese is a great replacement to normal mozzarella. It’s perfect sliced with tomato and basil or on crackers like my 5 seed oatcakes. It’s very important to use agar agar powder rather than flakes as the powder is much more potent. It’s important to use a good non-stick pan when making this cheese. You want one that will let you stir the cheese mixture constantly until it forms one solid shape without adding any fat. In the video, I use a non-stick ceramic pan with a “healthy” coatings that is free of PFOA, PFAS, lead and cadmium. This recipe could be used to make lots of little balls of cashew mozzarella. Just spoon off the mixture and roll into balls then drop in the water. However, as I’m all about the easy recipes I decided to do one cheese ball large. As with all of my recipes its high in natural produce and the taste can vary a lot. Do taste a tiny amount before cooking to check its the right strength for you – although remember it loses water once cooked. 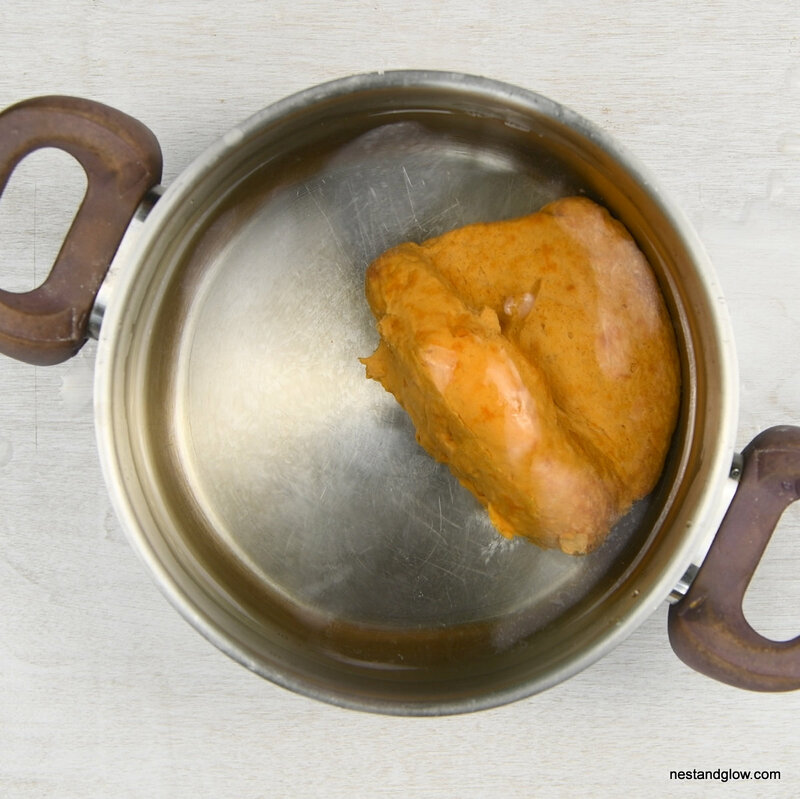 Add more nutritional yeast, salt or smoked paprika to suit your taste. 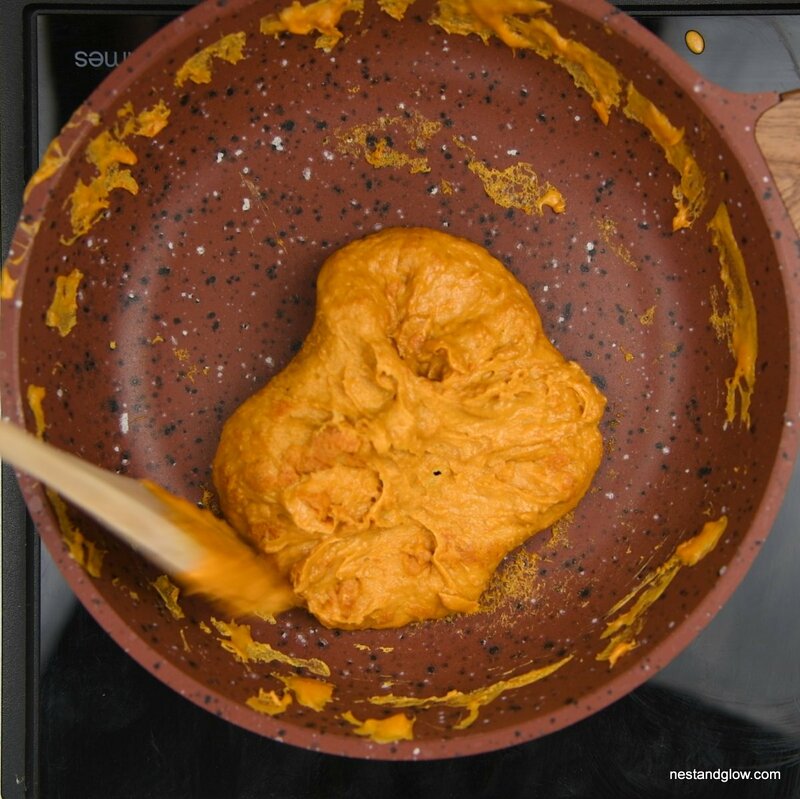 Pour into a non-stick pan. Heat on low for 3-4 minutes stirring constantly making sure none of the cheese burns. 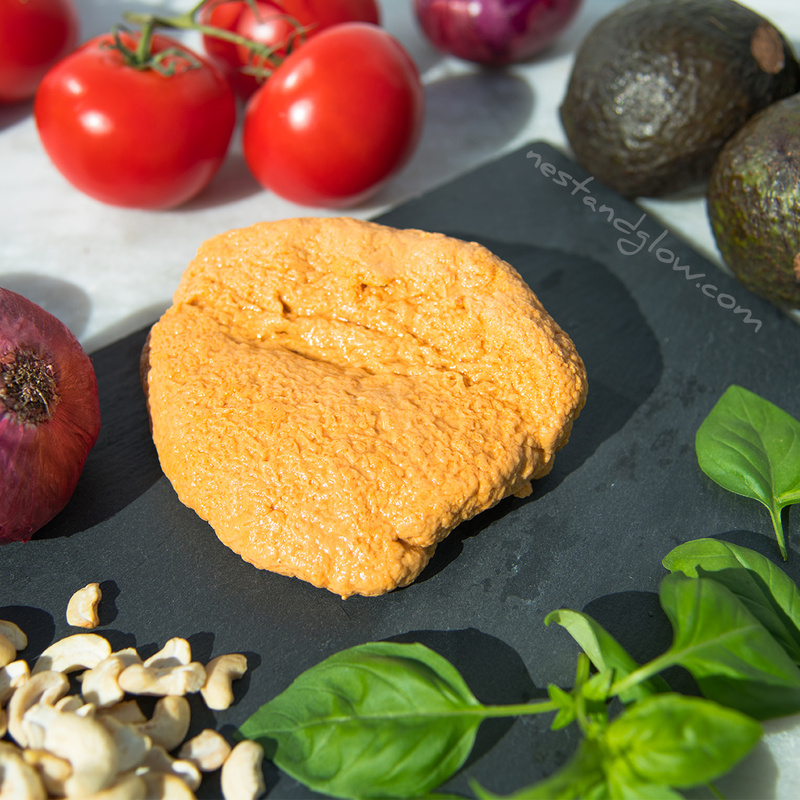 Fold the mixture into the middle to make one ball of yummy cashew cheese goodness. See the video for a demo of how it should look. Drop the cheese into a container filled with cool water and cool for an hour until firm. Enjoy within 5 days and keep in the fridge. Remove from the water once set. Well it sounds like you had a great experience anyhow. Thanks for sharing all your recipes! You’re welcome, really nice to hear you like my recipes! Can the cheese be ‘melted’ like if used on a pizza? Hi there, it melts a bit but it isn’t a direct replacement for normal cheese in recipes as won’t go as gooey. I forgot to put in the nutritional yeast and it turned out delicious anyway! I can’t wait to put it in my eggplant lasagna tonight! Thank you so much!! Oh wow that’s great to hear! Sounds like such a good use for it, yummy! 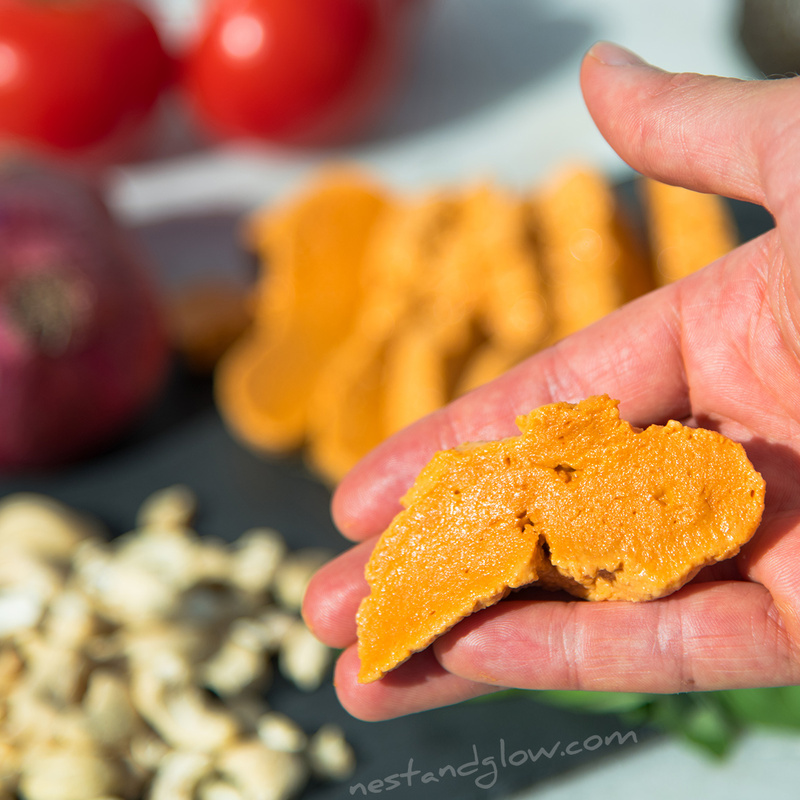 Do you recommend other cashew cheeses that I could leave out the nutritional yeast due to an allergy. Would you add other spices for flavor?